Mackinac Island is filled with two types of history: natural and physical. The geological formations of rocks and caves, wild flowers, and dramatic bluff vistas on Mackinac Island have helped bring visitors to this beautiful place for hundreds of years. This pristine spot in Lake Huron and the Straits of Mackinac was the country's second national park created three years after Yellowstone National Park. When the British moved Fort Michilimackinac to Mackinac Island in 1780 where it offered better protection, the purpose of the island changed. Americans took control of the fort in 1796. The first engagement of the War of 1812 took place on Mackinac Island when the British took back the fort. The American attempted to retake the fort in 1814 but failed in a bloody battle. The fort's soldiers cared for Mackinac Island National Park and when the fort closed in 1895, the country's first state park was formed: Mackinac Island State Park. Today, the stone ramparts, the south sally port and the Officer's Stone Quarters are all part of the original fort and look over the harbor and downtown. Fort Mackinac, part of the Mackinac Island State Park Commission, is open from May-October and includes buildings restored to how they looked during the later years of the fort's occupation. Park interpreters depict US Army soldiers from this same period complete with distinctive Prussian-inspired uniforms. Visitors can walk through 14 buildings filled with interactive displays and period furnishings while listening to 19th century bugle music, and cannon and rifle firings. 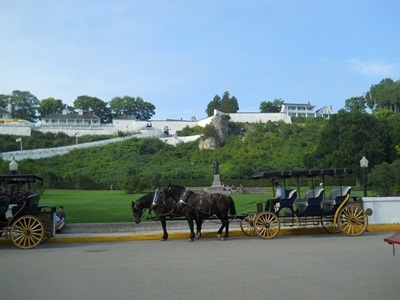 A long sidewalk leads visitors up to the Fort from the park below or horse-drawn taxis or tour carriages make stops at the rear entrance of the Fort atop the bluff.